The adult human body is made up of approximately 37 trillion cells (ball part figure – give or take around a couple of billion – Source). 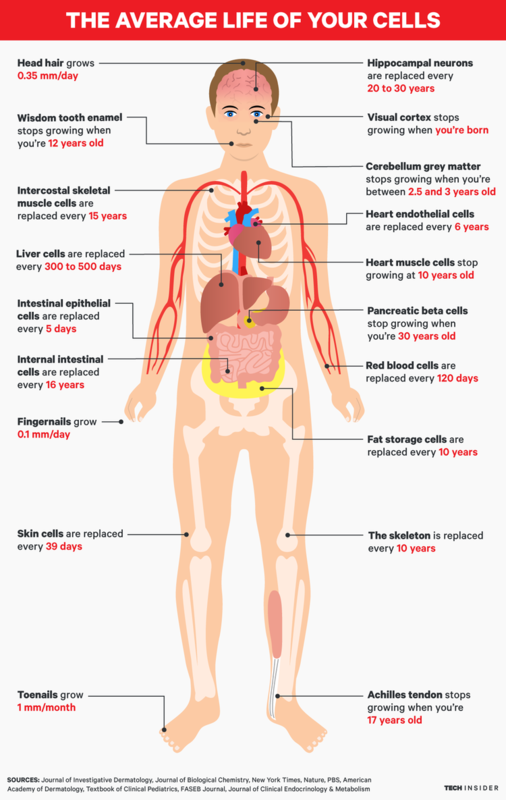 Of these, between 50-70 billion cells die and are generally replaced each and every day in an average adult (Please note: With 86,400 seconds in a day, that is a replacement rate of 55,000 cells per second! WOW!). Admittedly, the bulk of those cells being replaced are in the blood, skin and intestines. But you have to agree that it is still an incredibly high amount of turn over. 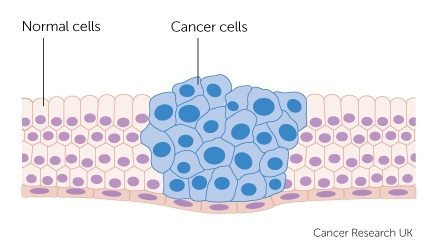 And each time each of those cells divide, something could potentially go wrong resulting in one of those millions of cells starting to multiply unchecked and uncontrollably (aka cancer). It is rather miraculous really – just think of all the trillions of cells that have come and gone during your entire life time – just one of them needed to go rogue and hey-presto: cancer. Mother nature seems to be a little more concerned about this situation than we are though, and she has planned ahead by bestowing us with many different anti-cancer systems which help to prevent any silly ‘rogue’ cell ambitions. These anti-cancer measures range from programmed cell death mechanisms (like apoptosis), to simply shutting cells down and making them dormant. Que? What do you mean “shutting cells down and making them dormant”?!? Yes, this is that “extra baggage” I was referring to in the introduction. As we age, our bodies collect – or there is a general increase in the number of – senescent cells. Senescence is recognised as a cellular program that induces a stable cell growth arrest, meaning that it is a system of stopping cells from dividing. Historically, senescence has been viewed as an irreversible cell-cycle halting mechanism, which functions to protect us against cancer. But more recently this idea has evolved, as a result of discoveries that have extended the role of cellular senesence away from just stopping dividing cells to include more complex biological processes, from influencing development and tissue repair all the way throught to ageing and age-related conditions (like Parkinson’s). For one thing, it is now apparent that non-dividing cells can become senescent. But how can dormant senescent cells influence their surroundings? By releasing chemicals which can influence the world around them… and not always in the most positive way. The release of such chemicals by senescent cells means that those cells have acquired a senescence-associated secretory phenotype (or SASP). SASP is a state where the cell is no longer doing what it is supposed to normally be doing, and it has effectly shut down. But it is still releasing chemicals that send messages to the world around it. And as I suggested above, some of those messages are not helpful. For example, as we age, the SASP is believed to be at least partially responsible for some of the chronic inflammation associated with the aging process (also known as ‘inflammaging’), which contributes to multiple age-related conditions. Inflammation is the immune system’s response to problems in the body, and by senescent cells continuously sending negative ‘pro-inflammatory’ messages out, the immune system is kept very busy. 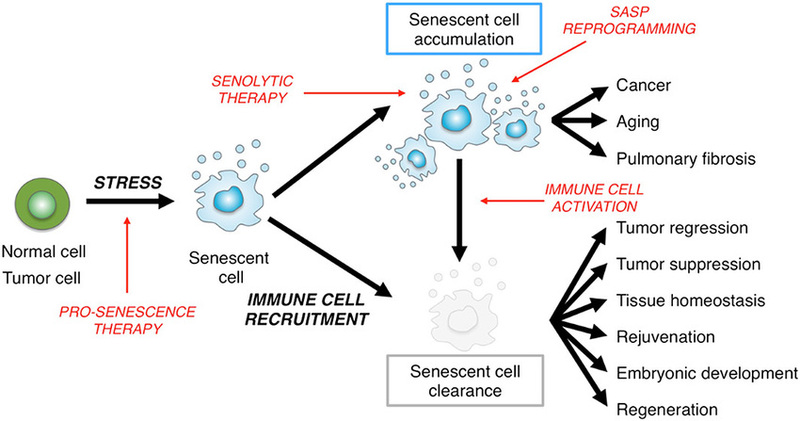 Click here for a very good OPEN ACCESS review of senescence in ageing. Ok, but what does any of this have to do with Parkinson’s? Several years ago, some researchers at the Mayo Clinic College of Medicine (Rochester, Minnesota) reported something interesting about senescent cells: they shorten the life span of mice. Title: Clearance of p16Ink4a-positive senescent cells delays ageing-associated disorders. Authors: Baker DJ, Wijshake T, Tchkonia T, LeBrasseur NK, Childs BG, van de Sluis B, Kirkland JL, van Deursen JM. Journal: Nature. 2011 Nov 2;479(7372):232-6. In this study, the scientists genetically engineered a mouse that would get rid of all senescent cells from all of the organs in the body (throughout life). When they compared these mice to normal mice, the investigators found that life-long removal of cells producing high levels of p16Ink4a delayed the onset of many age-related complications. Regular elimination of senescent cells from mice resulted in the animals remained youthful longer, based on measures of their mobility, muscle mass, and fat storage. Title: Astrocyte senescence as a component of Alzheimer’s disease. Authors: Bhat, R., Crowe, E.P., Bitto, A., Moh, M., Katsetos, C.D., Garcia, F.U., Johnson, F.B., Trojanowski, J.Q., Sell, C., Torres, C.
In this study, the researchers looked at levels of two proteins associated with senescence (metalloproteinase-1 (or MMP-1) and p16INK4a) in astrocytes in fetal, middle aged (35 to 50 years) and elderly (78 to 90 years) brain tissue samples. Compared with the fetal tissue samples, the investigators observed a significant increase in the number of astrocytes with high levels of these two proteins. And this number increased when the researchers looked at elderly brains. In addition, samples from people who passed away with Alzheimer’s harboured a significantly greater level of p16INK4a-in astrocytes compared with samples from normal-healthy adult control subjects of similar ages. Astrocytes (Astro from Greek astron = star and cyte from Greek “kytos” = cavity but also means cell) are star-shaped cells in the brain that play a critical role in maintaining the carefully balanced environment and provide support to the other types of cells. 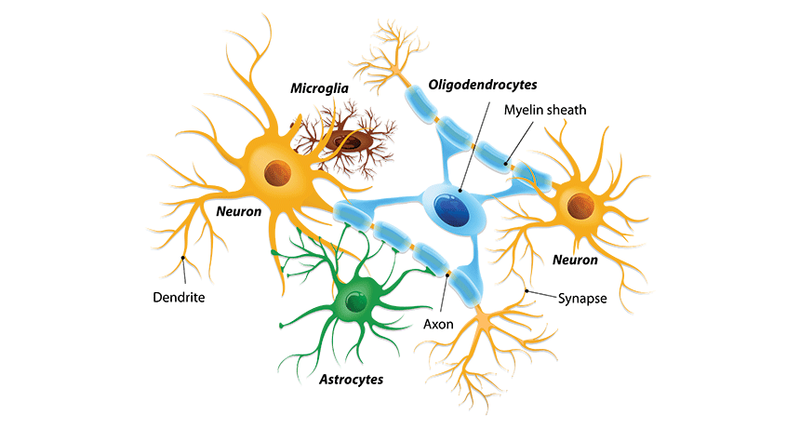 While neurons get all of the attention because they are the cells sending messages to different parts of the brain, astrocytes are very busy working in the background, holding the show together. Understand that without astrocytes, the wheels on the wagon would come off very quickly. 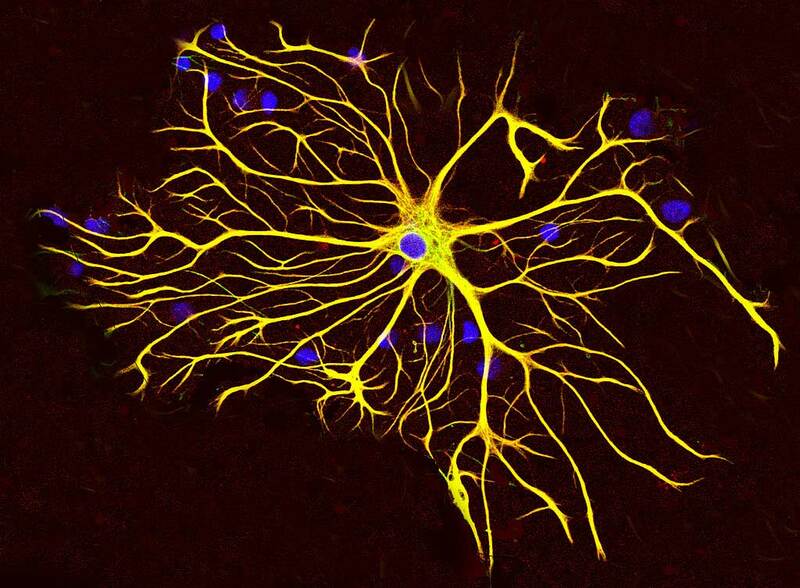 Astrocytes are some of the hardest working cells in the brain. They really regulate a lot of what is happening up there, from modulating synaptic transmission (the passing of signals from neuron to neuron) and soaking up excess neurotransmitters (the chemicals that pass the signal from neuron to neuron, such as dopamine) to responding to injury in the brain (by forming the ‘glial scar’). Is there any evidence that senescent astrocytes are involved in Parkinson’s? Authors: Chinta SJ, Woods G, Demaria M, Rane A, Zou Y, McQuade A, Rajagopalan S, Limbad C, Madden DT, Campisi J, Andersen JK. Journal: Cell Rep. 2018 Jan 23;22(4):930-940. 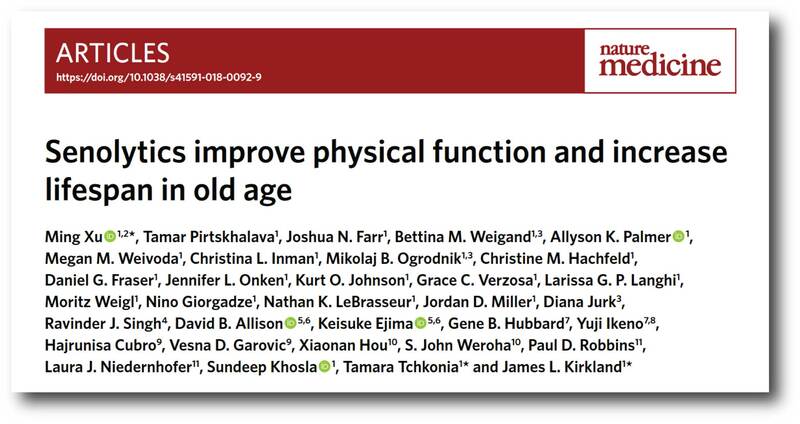 In this study, the scientists found an increase in the number of astrocytes exhibiting high levels of proteins associated with senescence in the brains of people with Parkinson’s, supporting the idea of a possible role for senescent cell burden in neurodegenerative conditions. Of particular interest, the inviestigators found evidence of senescence biomarkers in astrocytes in the substantia nigra (the region of the brain where the dopamine-producing neurons reside – the dopamine cells being a population badly affected by PD). For example, reduced levals of a protein called lamin B1 in cells is believed to be a marker of senescence. The less lamin B cells have, the more senescent they are. And in this study, the researchers found that many astrocytes in the Parkinsonian brain were lacking lamin B1 (while no significant difference was detected in aged-matched control tissues). You can see an example of this result in the image below: blue staining indicates the nucleus of cells, red staining denotes astrocytes, and green staining labels lamin B1. Note the lack of green staining where the red astrocyte should be in bottom right panel (from the Parkinson’s sample; indicated by a red arrow) even though the nucleus of the neighbouring cell still has lamin B1 protein (green; indicated by a yellow arrow). 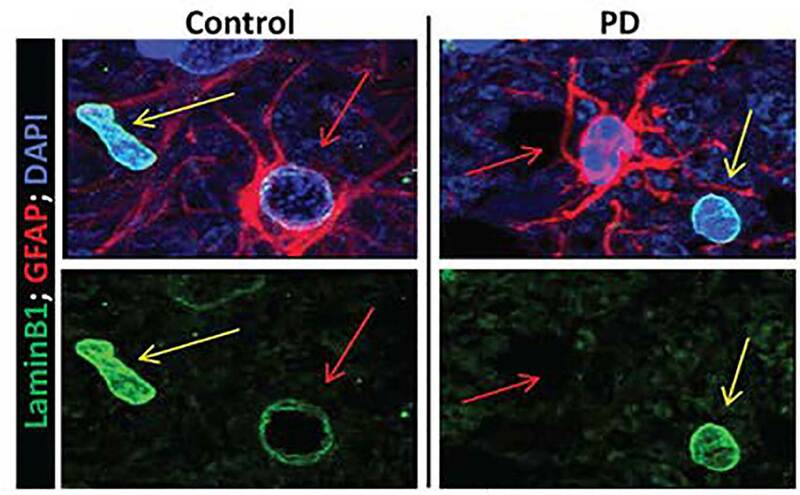 Next the researchers sought to determine if chemicals associated with increasing the risk of developing Parkinson’s could also induce cellular senescence in human astrocytes. They selected the herbicide paraquat for this analysis, and they found that after exposing astrocytes grown in cell culture to paraquat, there was a robust increase in levels of proteins associated with senescence. They also found that low but sustained doses of paraquat increased the percentage of senescent astrocytes over time, suggesting that even low exposures to such a chemical over time could have an impact. For their next experiment the investigators grew dopamine neurons in the cell culture solution which had been previously used to support senescent astrocytes and they found a significant reduction in the viability of dopamine neurons (compared to a control group of dopamine neurons that they grew in normal solution). This suggested that the senescent astrocytes were releasing certain compounds into their surrounding environment that could be having a negative impact (even after the solution is transferred to a different set of cells). 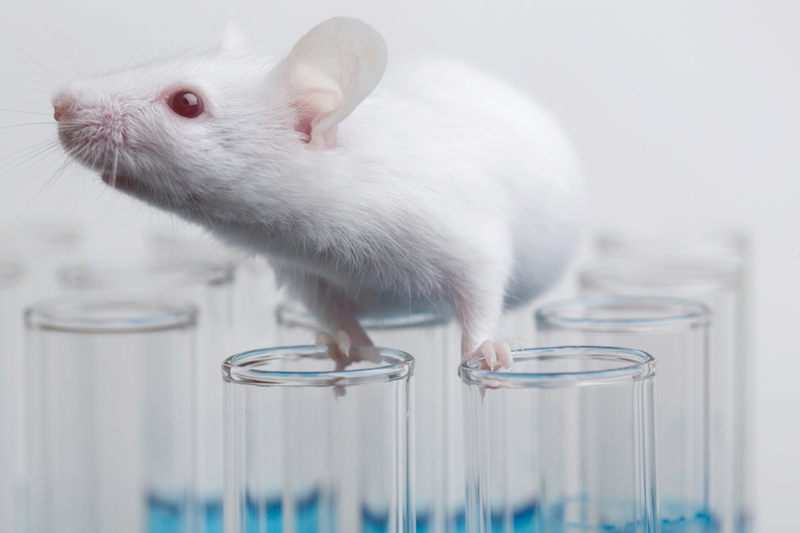 The investigators then used genetically engineered mouse in which senescent cells are automatically killed off (similar to the study mentioned further above). They began exposing these mice (and some normal control mice) to a continuous low dose of paraquat, which increased levels of senescence-associated protein p16INK4a in the substantia nigra (the region where the dopamine neurons live). When they looked at dopamine neurons in the genetically engineered mice, the investigators found that the removal of senescent cells reduced the levels of dopamine cell loss associated with paraquat treatment (compared to normal mice given the same toxin). Thus, the researchers concluded that “therapies that target senescent cells may constitute a strategy for treatment of sporadic Parkinson’s, for which environmental exposure is a major risk factor”. Wow. So astrocytes can become senescent in Parkinson’s? What about dopamine neurons? Can they become senescent? Authors: Riessland M, Kolisnyk B, Kim TW, Cheng J, Ni J, Pearson JA, Park EJ, Dam K, Acehan D, Ramos-Espiritu LS, Wang W, Zhang J, Shim J-W, Ciceri G, Brichta L, Studer L, Greengard P.
In this study, the researchers were interested in a protein called SATB1. Title: Identification of neurodegenerative factors using translatomeregulatory network analysis. Authors: Brichta L, Shin W, Jackson-Lewis V, Blesa J, Yap EL, Walker Z, Zhang J, Roussarie JP, Alvarez MJ, Califano A, Przedborski S, Greengard P.
Journal: Nat Neurosci. 2015 Sep;18(9):1325-33. In this study, the researchers reported that SATB1 was involved in the neurodegeneration of dopamine neurons in mouse models of Parkinson’s. When they removed this protein from dopamine neurons in mice, it resulted in those neurons dying in a similar fashion to the cells being treated with a neurotoxin. But in their new, more recent manuscript, those same researchers reported that the dopamine cells with reduced levels of SATB1 protein were not necessarily dying because of cell death, but rather the loss of SATB1 was resulting in the dopamine neurons becoming senescent. And interestingly, this effect was specific to the dopamine neurons, as cortical neurons exhibited other effects from the loss of SATB1, but they were still viable. The researchers found that when they removed SATB1 from embryonic stem cells, and then grew those cells into dopamine neurons, the cells missing SATB1 failed to fully develop into mature dopamine neurons. Compared to normal dopamine neurons, the cells missing SATB1 had shorter branches and struggled to survive beyond 60 days in cell culture. When they further investigated the biology of the dopamine neurons missing SATB1, they found that they presented many of the classical features of cellular senescence (such as SASP and reduced levels of Laminin B – described above) in the dopamine neurons. The researchers also found that dopamine neurons lacking SATB1 had impaired lysosomal and mitochondrial function. Inside the lysosomes are enzymes which help to break material down into useful parts. The lysosome will fuse with other small bags (called vacuole) that act as storage vessels of material inside a cell. The enzymes from the lysosome will mix with the material in the vacuole and digest it (or it break down into more manageable components). Issues with lysosomal function are believed to be involved with certain aspects of Parkinson’s, perhaps resulting in the build up of clustered/aggregated proteins in the cell. And mitochondria – you may recall from previous SoPD posts – are the power stations of each cell. They help to keep the lights on. Without them, the party is over and the cell dies. And the researchers had discovered that dopamine neurons lacking SATB1 had issues with their lysosomal and mitochondrial functions. Interesting, but how was the absense of SATB1 causing senescence to occur in dopamine neurons? The investigators next sought to determine why the absense of SATB1 would lead dopamine neurons to become senescent, and they found that SATB1 binds a region of DNA controlling a gene called CDKN1A. They also noted that CDKN1A levels in dopamine neurons with no SATB1 were higher than normal dopamine neurons, which led them to think that SATB1 was repressing levels of CDKN1A. In the absense of SATB1, CDKN1A levels increased, leading to the dopamine neuron becoming senescent. This is an interesting finding because CDKN1A is already a known player in senescence phenomenon (Click here and here to read more about that). The researchers completed their study by evaluating the loss of SATB1 in rodents and found that 2 weeks after reducing SATB1 levels in dopamine neurons, the cells exhibited many of the signs of senescence. In addition, there was an increase in the levels of activation of microglial cells – the resident immune cells – which become activated when dopamine cells are not well or dysfunctional. The investigators also looked for markers of senescence in dopamine neurons on sections of postmortem brain tissue from people who had passed away with (or without) Parkinson’s, and they found a significant increase in those markers in the PD brains (compared to control brains). Has SATB1 ever been associated with Parkinson’s before? 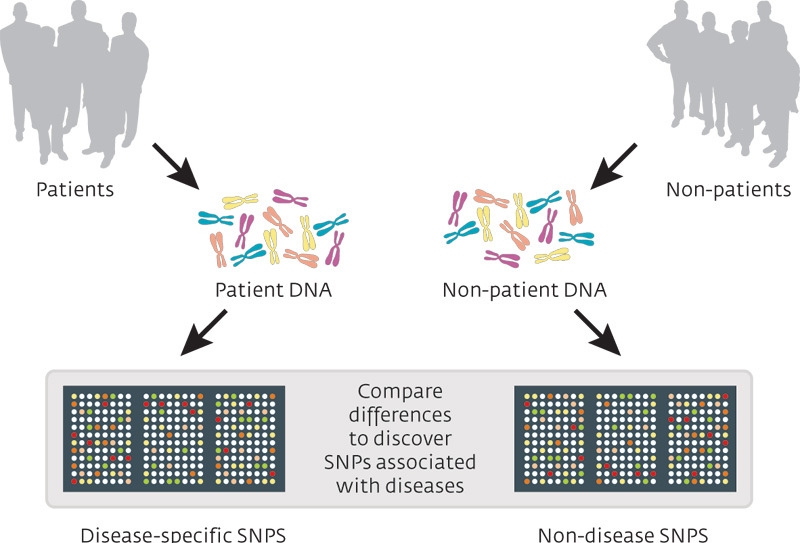 We all have these tiny genetic mutations, but what a GWAS does, is seek to determine whether people with a particular trait (for example, people with red hair) have a shared single nucleotide polymorphisms, compared to people that do not have that trait. A GWAS analysis of red haired people would point towards a variation on chromosome 16 (in the MC1R gene). After looking at the results of both datasets, this 2017 study found that SATB1 was associated with a higher risk of developing Parkinson’s, which (given the new senescence data) begs the question of whether people with SATB1 genetic variants have a “senescence-based” form of Parkinson’s. Obviously this question requires further research before we jump to any conclusions, but a more recent analysis of the genetics of Parkinson’s has also found variants in the SATB1 gene to be a risk factor for PD (Click here to read more about that study). Interesting. Are there any treatments being developed for senescent cells? They are being referred to as senolytics – a combination of the words “senescence” and “lytic” which means ‘destroying’). Several companies are seriously investigating senolytics. In particular, a small biotech company called Unity biotechnology. And this company seems to be very serious about moving forward with treatments that selectively target senescent cells (the management team of Unity biotechnology have collectively taken 91 therapeutic candidates into human clinical trials and they are responsible for the creation of 13 FDA-approved medicines – like I said, serious) and they have some serious money backing them (Amazon boss Jeff Bezos’ venture fund Bezos Expeditions and PayPal co-founder Peter Thiel’s Founders Fund are investors – again: serious). Currently the company has pre-clinical programs for inflammatory joint diseases and ophthalmology, but they are certainly exploring other conditions and Parkinson’s is hopefully one of them in the wake of this current research report. And Unity biotechnology are not alone in this area of targeting cellular senescence. Oisin biotechnology are another company designing at such therapies. To be completely fair, this is rather blue sky research (with clinical applications still some ways off in the future), but it is a very interesting idea and major biotech firms are certainly having a good hard look at it. And all this effort could be of particular interest to Parkinson’s. Title: Senolytics improve physical function and increase lifespan in old age. Authors: Xu M, Pirtskhalava T, Farr JN, Weigand BM, Palmer AK, Weivoda MM, Inman CL, Ogrodnik MB, Hachfeld CM, Fraser DG, Onken JL, Johnson KO, Verzosa GC, Langhi LGP, Weigl M, Giorgadze N, LeBrasseur NK, Miller JD, Jurk D, Singh RJ, Allison DB, Ejima K, Hubbard GB, Ikeno Y, Cubro H, Garovic VD, Hou X, Weroha SJ, Robbins PD, Niedernhofer LJ, Khosla S, Tchkonia T, Kirkland JL. Journal: Nat Med. 2018 Aug;24(8):1246-1256. In this study, the researchers injected mice with senescent cells and looked to see what kind of impact they had on the animals. Remarkably, the investigators found that transplanting a relatively small number of senescent cells into young mice was sufficient to cause not only physical dysfunction, but also cellular senescence other cells in the mouse. The senescent cells reduced the overall survival of the injected mice, which (the researchers suggested) demonstrated “the potency of senescent cells in shortening health- and lifespan”. Of particular interest, however was a drug cocktail that the investigators used to try and clear the senescent cells. They used a combination of Dasatinib and Quercetin, and they found that this treatment resulted in the “selective elimination of senescent cells”, and it also decreased the number of naturally occurring senescent cells as well as their proinflammatory secretions in cultured human tissue. In addition, intermittent oral administration of this cocktail (both to senescent cell-transplanted mice and normally aged mice) rescued physical dysfunction and increased overall survival (by 36%!). Wow! What are Quercetin and Dasatinib? Quercetin is a plant pigment (flavonoid), which is found in many plants and foods, such as red wine, onions, green tea, etc. The researchers do not believe it is a senolytic, but it serves to enhance the senolytic properties of the second drug: Dasatinib. Dasatinib (sold under the brand name Sprycel) is a BRC-ABL inhibitor that is used in the treatment of chronic myeloid leukemia (CML) – a kind of blood cancer. And for anyone who has been following Parkinson’s research for the last few years, alarm bells should be ringing. One of the most anticipanted set of clinical trials currently being conducted for Parkinson’s focuses on a drug called Nilotinib, which is also a BRC-ABL inhibitor (Click here to read a previous SoPD post on this topic and click here to learn more about Dasatinib). The fact that Dasatinib is being used to clear senescent cells does kind of beg the question: Could Nilotinib do the same thing??? Admittedly, Dasatinib (made by Bristol-Myers Squibb) does differ from Nilotinib in that it is also an active inhibitor the Src family of tyrosine kinases (which Nilotinib does to a much less extent). But it would certainly be interesting for someone in the PD research community to have a look-see if Nilotinib and Quercetin have any combined impact on senescence. Rockefeller University? You reading this? Are there any clinical trials for dasatinib and quercetin? Researchers at the Mayo Clinic in Rochester (Minnesota) have been conducting a Phase II clinical trial assessing the effect of senescent cell clearance on physical ability and mesenchymal stem cell functionality in patients with chronic kidney disease. The study involves 20 participants who will be randomly assigned to two groups: observational controls or treatment (with dasatinib and quercetin). The study is expected to report in 2021 (Click here to read more about this study). Oh, and if dasatinib and quercetin fail to demonstrate any effect on senescent cells in humans, not to worry. There are a number of other senolytics already being proposed. Title: Fisetin is a senotherapeutic that extends health and lifespan. Authors: Yousefzadeh MJ, Zhu Y, McGowan SJ, Angelini L, Fuhrmann-Stroissnigg H, Xu M, Ling YY, Melos KI, Pirtskhalava T, Inman CL, McGuckian C, Wade EA, Kato JI, Grassi D, Wentworth M, Burd CE, Arriaga EA, Ladiges WL, Tchkonia T, Kirkland JL, Robbins PD, Niedernhofer LJ. In this study, the researchers evaluated 10 flavonoids for their senolytic properties, to determine if they could improve upon quercetin. Curcumin and Fisetin stood out in the analysis for their potential to reduce the number of senescent cells in cell culture. What are curcumin and Fisetin? Curcumin is an active component of turmeric (Curcuma longa), a dietary spice used in Indian cuisine and medicine. Curcumin exhibits antioxidant, anti-inflammatory and anti-cancer properties, crosses the blood-brain barrier and there are numerous studies that indicate neuroprotective properties in various models of neurological disorders. 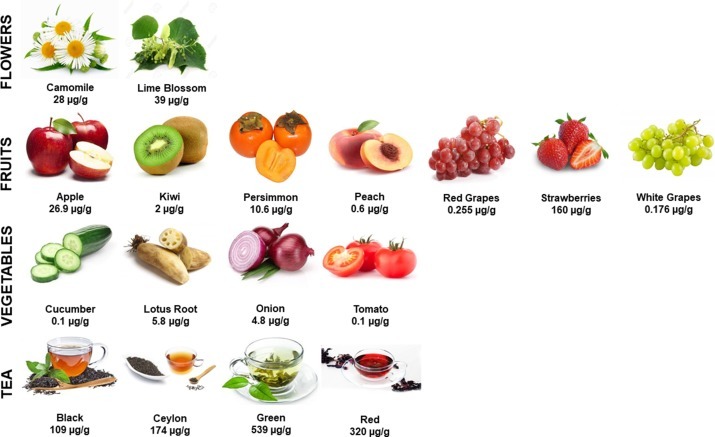 Fisetin is a flavonoid (a natural compound similar to quercetin) present in many fruits and vegetables (including apples, persimmon, grapes, onions, etc), which suggests that it is imminently translatable. Fisetin treatment in this recent study was found to extend the health and lifespan in normal mice, even when treatment was initiated in aged animals. And there is a building body of research to suggest that fisetin can be beneficial in neurotoxic models of Parkinson’s (Click here, here, here and here to read examples of this). It would be interesting to see what it can do in alpha synuclein models of PD. All of this said, there is a great deal of research currently focused on senolytics and you can be sure that we will be re-addressing this topic in future SoPD posts. So what does it al mean? So much for my promise to shorten these rants. But I hope you will agree that the research on senescent ‘zombie’-like cells is interesting, particularly as it could have important implications for Parkinson’s. 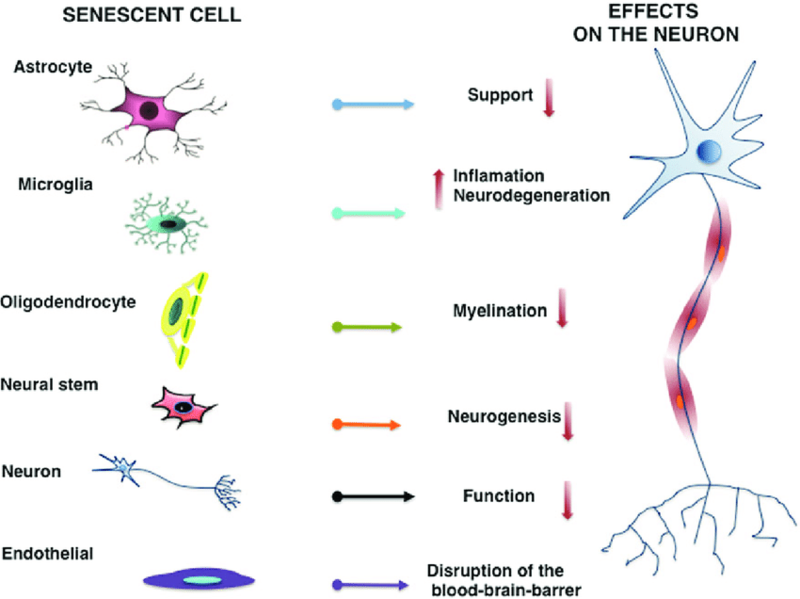 And there is a lot to support the idea of senescent cells having an influence on PD. Multiple research groups have recently discovered that cells in the brain have the ability to become dysfunctional with age, taking on a dormant like state that can have negative influences on their surrounding environment. There is evidence to suggest that these processes coud be affecting neurodegenerative conditions like Parkinson’s. The good news is that there are numerous biotech companies focused on developing therapies that address these senescent cells, and it will be interesting to see if they have any potential in the battle against Parkinson’s. As I suggested above, watch this space! More research on fisetin and curcumin today – Salk Institute researchers have announced the development of derivatives of these compounds, and they found that mice and flies treated with some of those derivatives not only had reduced biomarkers of ageing, but also had a longer median lifespans (Click here to read more about this new research). Abrexa Pharmaceuticals is moving one of the derivatives (J147) into clinical trials for Alzheimer’s next year. November 13, 2018 - 8:37 pm Lou T.
Fascinating stuff – I’m seriously on the verge of buying some fisetin, which is available as a supplement. I’m a little confused on one point, though. However, in the study comparing various flavonoids, quercetin is selected as a starting point for comparison, and it seems that neither quercetin, nor any of the other flavonoids, including the ultimate winner of the contest, fisetin, was tested in combination with dasatinib (or anything else). Dasatinib is only mentioned in passing, when describing the earlier study that combined quercetin with dasatinib. 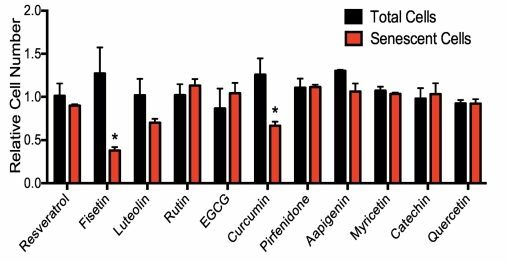 Thus, it would appear that dasatinib is not essential to the senolytic effects of quercetin, curcumin or fisetin. Can you comment on the reason that dasatinib was identified as a potential senolytic, and also on whether the combination of dasatinib with quercetin has a more potent senolytic effect than does quercetin by itself? I’d be interested to know if they have a specific synergy, or merely have separate, additive effects. Guess I’ll just keep on with my daily “Golden Milk” cuppa of hot Turmeric cocoa. It’s really good. I usually add some mannitol, just in case. My Uro has had me on Quercetin since I was 35 as an anti-inflammatory agent for prostatitis. There is a LOT of money behind the development of senolytics. Those Silicon Valley Billionaires want to enjoy their wealth as long as possible, and if they happen to come up with more miracle drugs along the way, more power to them. And to you fine Parkies out there, the world is changing fast, main thing is to try to stay as healthy as you can for as long as you can. My pop was diagnosed with it about 2 year before he died from Metastatic P/C, (another story about how Metformin probably kept him alive about 4 years longer than the doctors told him had). As I’ve often said, it ain’t lifespan, it’s healthspan! Yeah, ‘Reprogrammed’ stem cells implantation has started! November 15, 2018 - 5:55 pm Lou T.
And I have a related question regarding whether a short-term round of acute treatment (e.g., for five days, as was done for the naturally-aged mice in the final, confirmatory test of this study) might be performed to cull senescent cells, with a long-ish interval of non-treatment between such acute treatments, under the assumption that senescent cells could take a while to re-accumulate after such an acute culling. The mouse experiment of 100mg/kg per day would translate to human equivalents by dividing by the standard conversion ratio of 12.3, to get about 8.13mg/kg for a human. So, for a 60kg human, that would come to just under 500mg/day (and proportionally more or less if your weight is higher or lower than 60kg). They treated the mice for five days at that level, and then stopped for 72 hours, after which the mice were killed and tested for senescent cells, which were found to be spectacularly reduced – in most cases, to levels even lower than those for young mice. So, I’m imagining that maybe after a human has been on this treatment for five days, the number of senescent cells will have been reduced, and that person could quit taking the fisetin for a certain interval until they build up again. The mice can’t tell us how long that interval is, because they gave their lives for science before we could find that out. But is there any way to estimate how long it would take before senescent cells might need to be culled again (e.g., by another five day treatment)? I realize that these were mice and not humans, but I just want to get an idea if there are any obvious errors in my reasoning regarding dosing and the possibility of intermittent treatment. From these articles, it would appear that both Fisetin and Quercetin are both anti-senescent and PARP-1 inhibitors. So, it seems that these flavonoids are doubley good? November 23, 2018 - 2:17 pm Lou T.
Thanks for that. The most common dose in those clinical trials seems to be 20mg/kg daily. For a 175 lb person that is about 1600 mg daily. However, these studies only give that dose for a total of two consecutive days (in one case, the two days are repeated one month later). I don’t know how they came up with that dose, or with the two days. But at least, that does seem to implicitly endorse the idea that a brief interval of taking the fisetin may suffice for clearing away senescent cells, after which there could be a benefit that lasts through an interval of *not* taking the supplement (until senescent cells accumulate and need to be culled again). Especially the repetition after one month in the one experiment seems to suggest that kind of periodic culling is what they could have in mind. And another experiment measures outcomes significantly beyond the two-day interval of active treatment, which also suggests a lasting effect, and thus the possibility of episodic interventions. As already mentioned, the final mouse experiment used a dose equivalent to 8.13mg/kg for a human. So for that same 175 lb person you would have about 650mg daily. And that experiment ran for five days. In the name of caution, I think I would go for the lower dose over five days. I’d rather not take 1600mg of a new substance at once. So I’ll probably do five days at 600 mg and then see how I feel. The PARP inhibibition capacity of fisetin is an interesting bit of added information. If you can get it. That stuff is sold out everywhere. Reminds me of the resveratrol craze. November 30, 2018 - 10:02 am Lou T.
It’s back now on iherb.com (Doctor’s Best brand). I wrote to Doctor’s Best about taking a 600-700mg daily dose of their fisetin. They replied that they could not endorse that level of dosing because of the lack of completed clinical trials demonstrating safety at that level. They said that they might change that recommendation depending on the outcome of the higher-dose clinical trials now in progress. Just looked. They appear to OOS again already. December 9, 2018 - 8:55 am Lou T.
Haha, yes – but I got mine during that one day window. There’s another company (besides Doctor’s Best) called Rejuvenation Therapeutics that still has it. They’re a start-up and I have some from them, as well. They provided a nice Certificate of Analysis from a third party lab at my request, via email. So I like them although I trust an established player like DB more. Also, the plant from which both derive the fisetin, Rhus Succedanea, is toxic, so I would ideally want to trust the company extracting it to be sure those toxins do not end up in the product. And one Amazon reviewer for the RT fisetin did claim a rash developed, which is a symptom that can be caused by the plant’s toxins. November 15, 2018 - 6:12 pm Lou T.
It seems that demand for fisetin has exploded, with every normally-priced online outlet completely sold out. There’s even a guy in a trench coat on my street corner who is hawking it to old-looking people at three times the price. He called me over, and I’m really insulted, but anyway, I was wondering: since curcumin was the runner-up in the in vitro part of this derby, what are the chance that it would have had similar effects upon senescent cells if used for the same kind of five-day, high-dose, acute in vivo treatment as was performed on the mice in your linked article using fisetin? I ask in part because my partner has been dosing Longvida curcumin for years at a 3x400mg level daily. So I’m not sure if 500mg/day of fisetin would improve upon that. Much of the content on this website is written in the wee small hours of the night. As a result, the posts are usually littered with typos. Thanks for noting this one, I will edit it immediately. If you spot any others, you can email me at scienceofparkinsons@gmail.com. Also quite interesting was the work from the same UK center on senescent cells and cancer super cells. Man, it surely feels like we’re getting closer to improving Healthspan (and maybe even Lifespan), but then again, I’m not a mouse. Thanks for highlighting Azithromycin. I was not aware of it, but will look into it.